Help try save this old Keighley building from being made into flats. Labels: This is the main house. This site is dedicated to a gorgeous building i called home for 3 years. I was a resident of this school from age 6 to 9, it was a boarding school then for sick children. There wasn't many children there but they all had similar problems like Asthma, hole in the heart, mainly broncial problems. Sadly most of these children have now died and to my knowledge only 3 of the students from when i was there are alive now. After i left Whinburn at 9 it was closed for a while then re opened as a bad boys school, then it closed again and imagine my horror when i saw that the council were considering selling it to a company to be renovated into flats.. I mean this is a grade II listed building and heritage gardens.. gardens that contain badger, deer, owls and foxes. It has out buildings that house colonies of rare bats. That i believe are protected now. I know the bats well as I woke up one morning to find one with an injured arm hanging from my counterpain, the students nursed the little fella back to health then released him. Also the whinburn fish pond used to be home to many frogs and crayfish. It also had a different pond that had thousands of newts living in it, don't know if they are still there but i believe now that some types of newt are becoming rarer. most of the newts were common newts but i had seen crested ones in there, as myself and some other kids used to catch them. And when i left Whinburn I took several newts and bred them in tanks at home then returned them when i got too many to keep. I am quite new to the setting up bolg thingy but if anyone would like to comment on this gorgeous place being turned into flats please feel free to comment, I will be adding pictures so you can all see what the fuss is about. 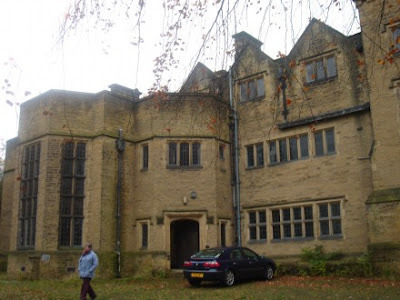 All I ask for is some help in saving one of Keighleys most precious buildings. Who knows any comments left might not help.. but ya don't know if ya don't try as my dad says.